For the past month and a half, I have been working at my school's newly-developed Writing Studio tutoring fellow students on how to convey their thoughts and ideas through their writing. During a recent staff meeting, we were asked to link up the definition of the word "Ghost Dance" to our experiences thus far at the Studio. I thought (since I've been runnin dry lately on posts) I'd share it here. 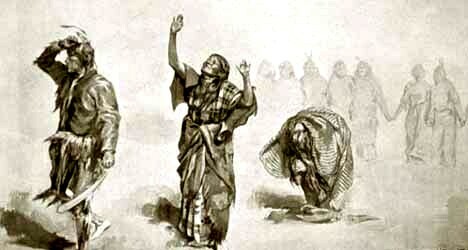 Ghost Dance: an American Indian religious cult of the second half of the 19th century, based on the performance of a ritual dance that, it was believed, would drive away white people and restore the traditional lands and way of life. During my time at the Writing Studio, I have done nothing but progress. I have moved forward in my thinking, gained experience in my knowledge of writing and improved my interpersonal skills. If given the opportunity to participate in a “Ghost Dance”, I would refuse. As thinkers and executers, we must move forward; while taking influence from the past is always a necessity, these ideas and experiences should not be used to regress to former states of being. In my job of helping other students, I too have learned from my peers how to be a better writing consultant; I’ve learned from my mistakes and realized what works and what does not. I hope in the waning weeks of this semester, I learn more, progress more, and flourish as a consultant at the Writing Studio.